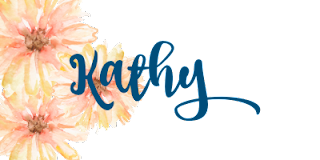 #stampinup #faithfulinkspirations When Stampin' Up debuted Tranquil Tide as one of its 2017-2019 In Colors, I didn't like it at all. I barely used it at first. But then I used it a couple of times and it began to grow on me. I was absolutely SOLD on this color when I received my box of supplies for the OnStage displays. There, in that wonderful box, was the "Rooted in Nature" stamp set and the lovely Nature's Poem Designer Series Paper. I also received a spool of Tranquil Tide Mini Ruffled Ribbon. I decided to feature this gorgeous sheet of Nature's Poem DSP on the card front, but I didn't want it to get lost on a Tranquil Tide Card Stock card base. I first tried a Whisper White Card Stock mat, and while that was OK, it didn't WOW me. Then I got the idea to use an Early Espresso Card Stock mat and--BLAMMO!--that was the perfect combination! 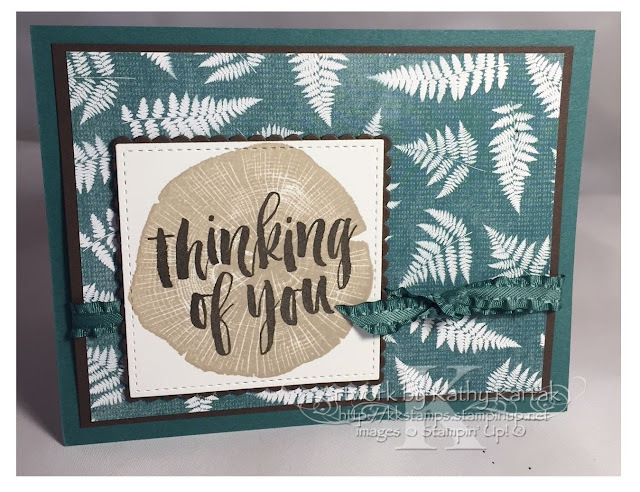 To make the card, I started by stamping the wood image from the "Rooted in Nature" set in Crumb Cake Ink onto Whisper White Card Stock. It took me a couple of tries to get this image just right. It's one of Stampin' Up's new, exclusive Distinktive stamps. Watch the video at the end of the blog to get an idea of how to use them. You need to have just the right saturation of ink and just the right pressure. Watch Tanner put pressure in the center of the stamp and around the edges. I found it easiest to put the pointer and middle finger of each hand onto the center of the stamp to give it the right pressure. You'll get the hang of it--just practice--and you'll be so glad you did because the Distinktive stamps are gorgeous! Once I had this image stamped perfectly, I stamped a sentiment from the same set in Early Espresso on top of the wood image. I cut this out with a square Stitched Shapes Framelit and adhered it to an Early Espresso scalloped square cut with one of the Layering Squares Framelits. Next, I adhered a 3-3/4" by 5" piece of Nature's Poem DSP to a 3-7/8" by 5-1/8 Early Espresso mat. I wrapped a length of the Tranquil Tide Mini Ruffled Ribbon around before adhering it to a Tranquil Tide Card Stock card base. I added the stamped image to the card with Stampin' Dimensionals. Such a quick and easy card, with bold colors and textures. Love!! Here's the video explaining the Distinktive stamps. Enjoy!